Author Keith W. Nolan chronicles the house-to-house combat in Hue City during the January 1968 assault. "This monograph focuses on the battles of Quang Tri City and Hue that took place during the 1968 Tet offensive. The offensive itself, an all-out effort by Viet Cong and North Vietnamese forces to overrun the major cities of South Vietnam, marked the turning point of the Vietnam War. Although the attacks were costly failures in military terms, they set the United States on a path of disengagement from the war that ultimately led to the fall of Saigon some seven years later. This document is a summary of the two-day military operations on urbanized terrain (MOUT) conference held at the RAND Washington, D.C. office on February 24-25, 1998. The conference was co-hosted by the RAND Arroyo Center and the United States Army Infantry School Dismounted Battlespace Battle Lab. The agenda included presentations on recent historical events (Grozny, Hue), ongoing operations in urban areas (Bosnia), and initiatives underway to improve future force readiness to conduct military operations in cities. Afternoon sessions challenged conference participants to develop near- and longer-term approaches to attain such improvements. This summary is a presentation of views presented and issues debated during the two-day period. Copies of the slides used by conference speakers appear in the appendices. Conference attendees agreed that a continued reliance on Second World War-type combat methods for operations in cities was counterproductive. While it was recognized that near-term improvements would be limited to enhancing current procedures via modified doctrine, training, and extant or proven concept technologies, such changes could at best result in marginal upgrades in force readiness. For the longer term, alternatives to large-scale commitments of U.S. manpower into urban areas and subsequent engagement of adversaries at close range was deemed desirable. Early research reflects that such a significant change in methodology may be feasible by the opening years of the next century's third decade. A Los Angeles Times Book Prize Finalist in History Winner of the 2018 Marine Corps Heritage Foundation Greene Award for a distinguished work of nonfiction The first battle book from Mark Bowden since his #1New York Times bestsellerBlack Hawk Down,Hue 1968 is the story of the centerpiece of the Tet Offensive and a turning point in the American War in Vietnam.In the early hours of January 31, 1968, the North Vietnamese launched over one hundred attacks across South Vietnam in what would become known as the Tet Offensive. The lynchpin of Tet was the capture of Hue, Vietnam's intellectual and cultural capital, by 10,000 National Liberation Front troops who descended from hidden camps and surged across the city of 140,000. Within hours theentire city was in their hands save for two small military outposts. American commanders refused to believe the size and scope of the Front's presence, ordering small companies of marines against thousands of entrenched enemy troops. After several futile and deadly days, Lieutenant Colonel Ernie Cheatham would finally come up with a strategy to retake the city, block by block and building by building, in some of the most intense urban combat since World War II. With unprecedented access to war archives in the U.S. and Vietnam and interviews with participants from both sides, Bowden narrates each stage of this crucial battle through multiple viewpoints. Played out over 24 days and ultimately costing 10,000 lives, the Battle of Hue was by far the bloodiest of the entire war. 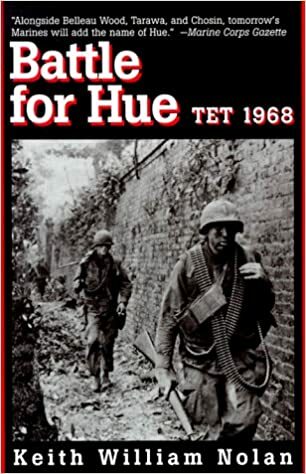 When it ended, the American debate was never again about winning, only about how to leave.Hue 1968 is a gripping and moving account of this pivotal moment. "As military historians go, Hammel stands among the very best. His 30-plus volumes dutifully record great Marine battle epics ... In reading Marines in Hue City, Marine veterans of the battles of Fallujah, and other Iraq city fighting, will relate through the photographs included in this coffee-table-sized volume ... Hammel does an outstanding job of combining the account of the battle with a bevy of new, never-before-published photographic images." Leatherneck "Marines in Hue City tells the story of the four-week Battle of Hue with concise prose and many strongly evocative photographs. Many are official USMC photos; others are never-before-published pictures taken by individual Marines. It all adds up to an excellent account of one of the Vietnam War's most pivotal battles." The VVA Veteran Over decades of conflict in Vietnam, Hue, the former imperial capital, had been spared. But everything changed on January 31, 1968, the eve of the lunar new year--a national holiday long marked by a mutual ceasefire--when the North Vietnamese launched a massive offensive. In the cataclysm of violence that convulsed South Vietnam during the now-infamous Tet Offensive, Hue was overrun--and the only forces available to counterattack were a handful of Marine infantry companies based eight miles south of the city. This photographic history chronicles the savage battle that followed as, for four excruciating weeks, the Marines of Task Force X-Ray fought house to house and street by street to retake the city so central to the Vietnamese culture and psyche. Through photographs taken in the heat of the action, readers will follow one of the wars most important campaigns, as ground gained is measured in painstaking inches and every alley, every street corner, every window might be the last. Vietnam, January, 1968. As the citizens of Hue are preparing to celebrate Tet, the start of the Lunar New Year, Nha Ca arrives in the city to attend her father's funeral. Without warning, war erupts all around them, drastically changing or cutting short their lives. After a month of fighting, their beautiful city lies in ruins and thousands of people are dead. Mourning Headband for Hue tells the story of what happened during the fierce North Vietnamese offensive and is an unvarnished and riveting account of war as experienced by ordinary people caught up in the violence. The bloody, monthlong battle for the Citadel in Hue pitted U.S. Marines against an entrenched, numerically superior North Vietnamese army force. By official U.S. accounts it was a tactical and moral victory for the Marines and the United States. But a survivor's compulsion to square official accounts with his contrasting experience has produced an entirely different perspective of the battle, the most controversial to emerge from the Vietnam War in decades. In some of the most frank, vivid prose to come out of the war, author Nicholas Warr describes with urgency and outrage the Marines' savage house-to-house fighting, ordered without air, naval, or artillery support by officers with no experience in this type of deadly combat. Sparing few in the telling, including himself, Warr's shocking firsthand narrative of these desperate suicide charges - which devastated whole companies - takes the wraps off an incident that many would prefer to keep hidden. His account is sure to ignite heated debate among historians and military professionals. Despite senseless rules of engagement and unspeakable carnage, there were unforgettable acts of courage and self-sacrifice performed by ordinary men asked to accomplish the impossible, and Warr is at his best relating these stories. For example, there's the grenade-throwing mortarman who, in a rage, wipes out two machine-gun emplacements that had pinned down an entire company for days. And the fortunate grunt with thick glasses who stumbles blindly - without receiving a scratch - across a street littered with the dead and dying who hadn't made it. Nicholas Warr's riveting account of the most vicious urban combat since World War II offers an unparalleled view of how a small unit commander copes with the conflicting demands and responsibilities thrust upon him by the enemy, his men, and the chain of command. This work summarizes the proceedings of the fourth annual Urban Operations Conference co-hosted by RAND Arroyo Center and representatives of the Army and Marine Corps. This compendium is the result of a conference on "Military Operations in an Urban Environment" cosponsored by the Patterson School of Diplomacy and International Commerce in conjunction with the Kentucky Commission on Military Affairs, the U.S. Army War College, and the Association of the United States Army. At the time of the conference, the concept of homeland defense was emerging as an increasingly important mission for the U.S. military. Now this mission has catapulted to prominence with the attacks of September 11 and the appointment of a Director of Homeland Defense-a Cabinet-level position. The authors of the chapters examine the ongoing doctrinal thinking, draw historical comparisons, and discuss the thoughts of those attending the conference-experts from the military, government civilian agencies, academia, think tanks, and the defense industry-regarding unconventional warfare. Collectively, they provide a comprehensive report on critical factors that the U.S. military soon may face. This is the last volume, although published out of chronological sequence, in the nine-volume operational history series covering the Marine Corps' participation in the Vietnam War. A separate functional series complements the operational histories. This book is the capstone volume of the entire series in that 1968, as the title indicates, was the defining year of the war. While originally designed to be two volumes, it was decided that unity and cohesion required one book. The year 1968 was the year of the Tet Offensive including Khe Sanh and Hue City. These were momentous events in the course of the war and they occurred in the first three month s of the year. This book, however, documents that 1968 was more than just the Tet Offensive. The bloodiest month of the war for the U.S. forces was not January, nor February 1968, but May 1968 when the Communists launched what was called their "Mini-Tet" offensive. This was followed by a second "Mini-Tet" offensive during the late summer which also was repulsed at heavy cost to both sides. By the end of the year, the U.S. forces in South Vietnam's I Corps, under the III Marine Amphibious Force (III MAF), had regained the offensive. By December, enemy-initiated attacks had fallen to their lowest level in two years. Still, there was no talk of victory. The Communist forces remained a formidable foe and a limit had been drawn on the level of American participation in the war. Although largely written from the perspective of III MAF and the ground war in I Corps, the volume also treats the activities of Marines with the Seventh Fleet Special Landing Force, activities of Marine advisors to South Vietnamese forces, and other Marine involvement in the war. Separate chapters cover Marine aviation and the single manager controversy, artillery, logistics, manpower, and pacification. Like most of the volumes in this series, this has been a cumulative history. "The 1968 Tet Offensive in Vietnam and the Seizure of Hue"
"Charlie Company's Battle for Hue"
Falkenburg, Luke. Marine Corps Gazette (Aug 2013) 97 (8): 47-50. "A Company Commander Reflects on Operation Hue City"
Author: Capt. G. R. Christmas; Marine Corps Gazette (April 1971) 55 (4): 34-39. "Hue City, 1968: Winning a Battle while Losing a War." "Weather and Thin Ranks Slow Marines' Tough Fight in Hue"
"Can the Marine Corps Overcome the Obstacles of Effectively Supplying the Small Infantry Unit in the 21st Century Urban Conflict?" need to understand the demands on the supply/transportation systems, and casualty dynamics. "Vision 2027: Warfighting Tenets That Will Enable Our Corps to Fight and Win"
and enduring principles of war both illustrate these maxims. Abstract: The United States Marine Corps has adopted Operational Maneuver From the Sea, and in conjunction with this revolutionized means of power projection, is evaluating small, highly mobile "Killer Team" organizations, heavily reliant on technology and indirect firepower, as the executor of operations ashore. The preponderance of the world's population, cities, and market centers are located on the littorals, where naval forces will find themselves engaged. This being the case, Marines must expect to fight in urban areas. An examination of the Battle for Hue in the Republic of Vietnam during the Tet Offensive of 1968, serves to illustrate that these small conceptual Killer Teams would be greatly pressed, and most likely fail in urban combat. learned focus upon surfaces and gap, concentration of force and speed of action, and attrition warfare versus deterioration of the enemy's cohesion. Tactical lessons learned focus upon urban tactics, combined arms weapon systems, and command/control. "The Battle for Hue, 1968"
The U.S. Intelligence Community declassified and released numerous items in various formats in recognition of the 50th Anniversary of the Tet Offensive. New content is expected to be added periodically. "Block by Block: The Challenges of Urban Operations"
"From Siege To Surgical: The Evolution Of Urban Combat From World War II To The Present And Its Effect on Current Doctrine"
From C-SPAN, 25 January 2018 - "The Newseum in Washington, DC, hosted a discussion on the Tet Offensive and the Battle of Hue, where some of the most intense fighting of the campaign took place. Speakers included Mark Bowden, author of Hue 1968: A Turning Point of the American War in Vietnam. Also, remarks by former Stars & Stripes photographer John Olson, plus three former U.S. Marines who fought in Hue during the Tet Offensive." The Archives Branch of the Marine Corps History Division holds approximately 15 collections related to the Marine Corps and Hue. This index highlights some of those collections, focusing on those that have notably unique content, are large in volume, or are frequently requested by Archives Branch patrons. Included in this compilation are collections that contain official Marine Corps reference records; personal papers collections; photographs; maps; and oral histories. This index does not cover every collection in the Branch’s holdings related to Hue. It highlights select collections from which researchers may start to explore the materials that the Archives has available on the subject.